Several wildfires are still burning through California. The Camp Fire in Northern California has killed at least 48 people and is now the deadliest ever recorded. The fire has burned 130,000 acres near Paradise, 80 miles north of Sacramento. Paradise, Malibu and other communities have been devastated by these fires. But beyond the local trauma, residents throughout California are seeing smoke plumes clouding the air. UC Davis cancelled classes last week due to unhealthy air quality. Data on Resource Watch shows the smoke and air pollution created by these fires. Fine particulate matter (PM2.5) is an easily inhalable pollutant linked to heart and lung problems, asthma and more. Any level of exposure to fine particulate matter increases health risks, but daily exposure of more than 25 micrograms per cubic meter (μg/m3) can be hazardous, according to the World Health Organization. (A microgram is one-millionth of a gram.) A few days after the Camp Fire started, hazardous air conditions spread throughout Northern California. In Chico, a town located just outside of Paradise, PM2.5 levels were over 152 μg/m3 on November 13 and 14. In the same time period, Yuba City experienced PM2.5 concentrations above 200 μg/m3. Downtown San Francisco saw PM2.5 levels exceeding 85 μg/m3. 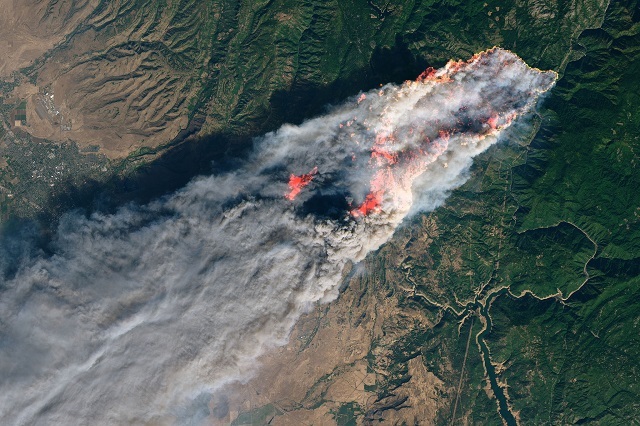 These wildfires endanger the environment, economies and health across the western United States. While Camp Fire has been the deadliest on record, it’s hardly the only devastating fire that California experienced this year. Just this August, the Mendocino Complex Fire was declared the largest fire in California’s history, burning more than 400,000 acres.